The Magna Carta ("Great Charter") was signed by King John on 15th June 1215 in Runnymede meadow by the River Thames between Windsor and Staines about 20 miles West of London. It was 'signed' (not with a pen but sealed with his royal seal) by John under duress as the Barons were in open revolt against the absolute authority of the King and had entered London demanding liberties and protection of their rights by law. 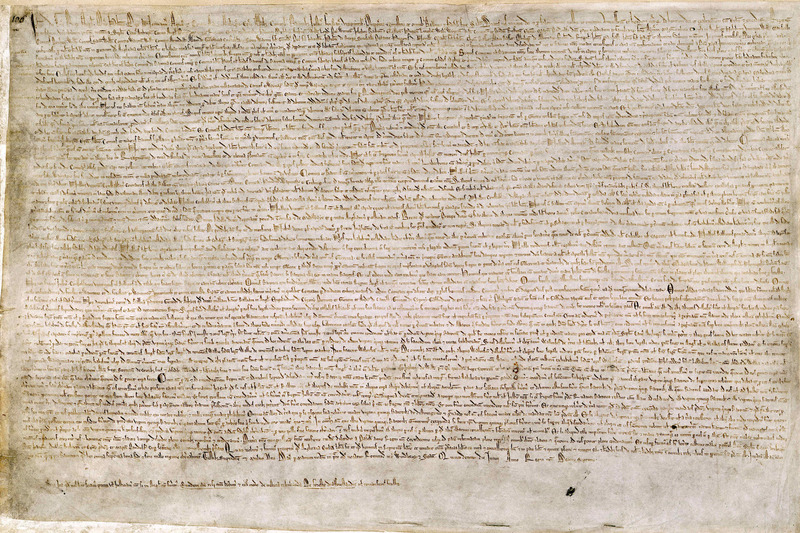 It is a remarkable document and, although based on a Charter of Liberties issued by Henry I in 1100, and later modified by Henry III in 1225, Edward I in 1297 and Henry VI in 1423, it remains the first recorded written declaration of constitutional law. It is the basis of many laws still in force today in England and Wales, and those of English speaking countries around the world. It declared the freedom of the Church, the right of liberties, inheritance and that no freeman could be punished except by the law of the land. 572 years later it inspired the founding fathers of America when they wrote the1787 United States Constitution. The original Magna Carta document was written in Latin and did not have paragraphs or clause numbers. These were added later for clarity and reference purposes. The document with John's 'Great Seal' does not survive but there are 4 surviving copies made at the time held in the British Library, Lincoln and Salisbury cathedrals and many copies of later versions. The Barons are listed in the introduction and included several Bishops, although the Pope later rejected the declarations as an infringement of the authority of the Church of Rome and declared that John need not adhere to it. John died one year later fleeing from the resulting unrest. 1. First, that we have granted to God, and by this present charter have confirmed for us and our heirs forever, that the English Church shall be free, and shall have its rights undiminished, and its liberties unimpaired. That we wish this so to be observed, appears from the fact that of our own free will, before the outbreak of the present dispute between us and our barons, we granted and confirmed by charter the freedom of the Church's elections , a right reckoned to be of the greatest necessity and importance to it , and caused this to be confirmed by Pope Innocent III. This freedom we shall observe ourselves, and desire to be observed in good faith by our heirs in perpetuity. We have also granted to all free men of our realm, for us and our heirs for ever, all the liberties written out below, to have and to keep for them and their heirs, of us and our heirs. 2. If any earl, baron, or other person that holds lands directly of the Crown, for military service, shall die, and at his death his heir shall be of full age and owe a `relief', the heir shall have his inheritance on payment of the ancient scale of `relief'. That is to say, the heir or heirs of an earl shall pay for the entire earl's barony, the heir or heirs of a knight 100s. at most for the entire knight's `fee', and any man that owes less shall pay less, in accordance with the ancient usage of fees. 3. But if the heir of such a person is under age and a ward, when he comes of age he shall have his inheritance without `relief' or fine. 4. The guardian of the land of an heir who is under age shall take from it only reasonable revenues, customary dues, and feudal services. He shall do this without destruction or damage to men or property. If we have given the guardianship of the land to a sheriff, or to any person answerable to us for the revenues, and he commits destruction or damage, we will exact compensation from him, and the land shall be entrusted to two worthy and prudent men of the same `fee', who shall be answerable to us for the revenues, or to the person to whom we have assigned them. If we have given or sold to anyone the guardianship of such land, and he causes destruction or damage, he shall lose the guardianship of it, and it shall be handed over to two worthy and prudent men of the same `fee', who shall be similarly answerable to us. 5. For so long as a guardian has guardianship of such land, he shall maintain the houses, parks, fish preserves, ponds, mills, and everything else pertaining to it, from the revenues of the land itself. When the heir comes of age, he shall restore the whole land to him, stocked with plough teams and such implements of husbandry as the season demands and the revenues from the land can reasonably bear. 6. Heirs may be given in marriage, but not to someone of lower social standing. Before a marriage takes place, it shall be made known to the heir's next-of-kin. 7. At her husband's death, a widow may have her marriage portion and inheritance at once and without trouble. She shall pay nothing for her dower, marriage portion, or any inheritance that she and her husband held jointly on the day of his death. She may remain in her husband's house for forty days after his death, and within this period her dower shall be assigned to her. 8. No widow shall be compelled to marry, so long as she wishes to remain without a husband. But she must give security that she will not marry without royal consent, if she holds her lands of the Crown, or without the consent of whatever other lord she may hold them of. 9. Neither we nor our officials will seize any land or rent in payment of a debt, so long as the debtor has movable goods sufficient to discharge the debt. A debtor's sureties shall not be distrained upon so long as the debtor himself can discharge his debt. If, for lack of means, the debtor is unable to discharge his debt, his sureties shall be answerable for it. If they so desire, they may have the debtor's lands and rents until they have received satisfaction for the debt that they paid for him, unless the debtor can show that he has settled his obligations to them. 10. If anyone who has borrowed a sum of money from Jews dies before the debt has been repaid, his heir shall pay no interest on the debt for so long as he remains under age, irrespective of whom he holds his lands. If such a debt falls into the hands of the Crown, it will take nothing except the principal sum specified in the bond. 11. If a man dies owing money to Jews, his wife may have her dower and pay nothing towards the debt from it. If he leaves children that are under age, their needs may also be provided for on a scale appropriate to the size of his holding of lands. The debt is to be paid out of the residue, reserving the service due to his feudal lords. Debts owed to persons other than Jews are to be dealt with similarly. 12. No `scutage' or `aid' may be levied in our kingdom without its general consent, unless it is for the ransom of our person, to make our eldest son a knight, and (once) to marry our eldest daughter. For these purposes only a reasonable `aid' may be levied. `Aids' from the city of London are to be treated similarly. 14. To obtain the general consent of the realm for the assessment of an `aid' , except in the three cases specified above, or a `scutage', we will cause the archbishops, bishops, abbots, earls, and greater barons to be summoned individually by letter. To those who hold lands directly of us we will cause a general summons to be issued, through the sheriffs and other officials, to come together on a fixed day (of which at least forty days notice shall be given) and at a fixed place. In all letters of summons, the cause of the summons will be stated. When a summons has been issued, the business appointed for the day shall go forward in accordance with the resolution of those present, even if not all those who were summoned have appeared. 15. In future we will allow no one to levy an `aid' from his free men, except to ransom his person, to make his eldest son a knight, and once to marry off his eldest daughter. For these purposes only a reasonable `aid' may be levied. 16. No man shall be forced to perform more service for a knight's `fee', or other free holding of land, than is due from it. 17. Ordinary lawsuits shall not follow the royal court around, but shall be held in a fixed place. 18. Inquests of novel disseisin, mort d'ancestor, and darrein presentment shall be taken only in their proper county court. We ourselves, or in our absence abroad our chief justice, will send two justices to each county four times a year, and these justices, with four knights of the county elected by the county itself, shall hold the assizes in the county court, on the day and in the place where the court meets. 19. If any assizes cannot be taken on the day of the county court, as many knights and freeholders shall afterwards remain behind, of those who have attended the court, as will suffice for the administration of justice, having regard to the volume of business to be done. 20. For a trivial offence, a free man shall be fined only in proportion to the degree of his offence, and for a serious offence correspondingly, but not so heavily as to deprive him of his livelihood. In the same way, a merchant shall be spared his merchandise, and a husbandman the implements of his husbandry, if they fall upon the mercy of a royal court. None of these fines shall be imposed except by the assessment on oath of reputable men of the neighbourhood. 24. No sheriff, constable, coroners, or other bailiffs of ours shall hold the pleas of our crown. 25. All counties, hundreds, wapentakes, and tri things, our demesne manors being excepted, shall continue according to the old farms, without any increase at all. 29. No constable shall force any knight to pay money for castleward if he be willing to perform that ward in person, or--he for a reasonable cause not being able to perform it himself--through another proper man. And if we shall have led or sent him on a military expedition, he shall be quit of ward according to the amount of time during which, through us, he shall have been in military service. 30. No sheriff nor bailiff of ours, nor any one else, shall take the horses or carts of any freeman for transport, unless by the will of that freeman. 33. Henceforth all the weirs in the Thames and Medway, and throughout all England, except on the sea-coast, shall be done away with entirely. 34. Henceforth the writ which is called Praecipe shall not be to served on any one for any holding so as to cause a free man to lose his court. 35. There shall be one measure of wine throughout our whole realm, and one measure of ale and one measure of corn namely, the London quart; and one width of dyed and russet and haberjet cloths namely, two ells below the selvedges. And with weights, moreover, it shall be as with measures. 36. Henceforth nothing shall be given or taken for a writ of inquest in a matter concerning life or limb; but it shall be conceded gratis, and shall not be denied. 38. No bailiff, on his own simple assertion, shall henceforth any one to his law, without producing faithful witnesses in evidence. 39. No freeman shall be taken, or imprisoned, or disseized, or outlawed, or exiled, or in any way harmed nor will we go upon or send upon him save by the lawful judgment of his peers or by the law of the land. 43. If any one hold from any escheat as from the honour of Walingford, Nottingham, Boloin, Lancaster, or the other escheats which are in our hands and are baronies and shall die, his heir shall not give another relief, nor shall he perform for us other service than he would perform for a baron if that barony were in the hand of a baron; and we shall hold it in the same way in which the baron has held it. 45. We will not make men justices, constables, sheriffs, or bailiffs unless they are such as know the law of the realm, and are minded to observe it rightly. 46. All barons who have founded abbeys for which they have charters of the king of England, or ancient right of tenure, shall have, as they ought to have, their custody when vacant. 47. All forests constituted as such in our time shall straightway be annulled; and the same shall be done for river banks made into places of defence by us in our time. 48. All evil customs concerning forests and warrens, and concerning foresters and warreners, sheriffs and their servants, river banks and their guardians, shall straightway be inquired into each county, through twelve sworn knights from that county, and shall be eradicated by them, entirely, so that they shall never be renewed, within forty days after the inquest has been made; in such manner that we shall first know about them, or our justice if we be not in England. 50. We shall entirely remove from their bailiwicks the relatives of Gerard de Athyes, so that they shall henceforth have no bailiwick in England: Engelard de Cygnes, Andrew Peter and Gyon de Chanceles, Gyon de Cygnes, Geoffrey de Martin and his brothers, Philip Mark and his brothers, and Geoffrey his nephew, and the whole following of them. 52. If any one shall have been disseized by us, or removed, without a legal sentence of his peers, from his lands, castles, liberties or lawful right, we shall straightway restore them to him. And if a dispute shall arise concerning this matter it shall be settled according to the judgment of the twenty-five barons who are mentioned below as sureties for the peace. But with regard to all those things of which any one was, by king Henry our father or king Richard our brother, disseized or dispossessed without legal judgment of his peers, which we have in our hand or which others hold, and for which we ought to give a guarantee: We shall have respite until the common term for crusaders. Except with regard to those concerning which a plea was moved, or an inquest made by our order, before we took the cross. But when we return from our pilgrimage, or if, by chance, we desist from our pilgrimage, we shall straightway then show full justice regarding them. 53. We shall have the same respite, moreover, and in the same manner, in the matter of showing justice with regard to forests to be annulled and forests to remain, which Henry our father or Richard our brother constituted; and in the matter of wardships of lands which belong to the fee of another warship of which kind we have hitherto enjoyed by reason of the fee which some one held from us in military service;--and in the matter of abbeys founded in the fee of another than ourselves in which the lord of the fee may say that he has jurisdiction. And when we return, or if we desist from our pilgrimage, we shall straightway exhibit full justice to those complaining with regard to these matters. 55. All fines imposed by us unjustly and contrary to the law of the land, and all amerciaments made unjustly and contrary to the law of the land, shall be altogether remitted, or it shall be done with regard to them according to the judgment of the twenty five barons mentioned below as sureties for the peace, or according to the judgment of the majority of them together with the aforesaid Stephen archbishop of Canterbury, if he can be present, and with others whom he may wish to associate with himself for this purpose. And if he can not be present, the affair shall nevertheless proceed without him; in such way that, if one or more of the said twenty five barons shall be concerned in a similar complaint, they shall be removed as to this particular decision, and, in their place, for this purpose alone, others shall be substituted who shall be chosen and sworn by the remainder of those twenty five. 56. If we have disseized or dispossessed Welshmen of their lands or liberties or other things without legal judgment of their peers, in England or in Wales,--they shall straightway be restored to them. And if a dispute shall arise concerning this, then action shall be taken upon it in the March through judgment of their peers- -concerning English holdings according to the law of England, concerning Welsh holdings according to the law of Wales, concerning holdings in the March according to the law of the March. The Welsh shall do likewise with regard to us and our subjects. 57. But with regard to all those things of which any one of the Welsh by king Henry our father or king Richard our brother, disseized or dispossessed without legal judgment of his peers, which we have in our hand or which others hold, and for which we ought to give a guarantee: we shall have respite until the common term for crusaders. Except with regard to those concerning which a plea was moved, or an inquest made by our order, before we took the cross. But when we return from our pilgrimage, or if, by chance, we desist from our pilgrimage, we shall straightway then show full justice regarding them, according to the laws of Wales and the aforesaid districts. 58. We shall straightway return the son of Llewelyn and all the Welsh hostages, and the charters delivered to us as surety for the peace. 59. We shall act towards Alexander King of the Scots regarding the restoration of his sisters, and his hostages, and his liberties and his lawful right, as we shall act towards our other barons of England; unless it ought to be otherwise according to the charters which we hold from William, his father, the former king of the Scots. And this shall be done through judgement of his peers in our court. 61. Inasmuch as, for the sake of God, and for the bettering of our realm, and for the more ready healing of the discord which has arisen between us and our barons, we have made all these aforesaid concessions, wishing them to enjoy for ever entire and firm stability, we make and grant to them the folIowing security: that the baron, namely, may elect at their pleasure twenty five barons from the realm, who ought, with all their strength, to observe, maintain and cause to be observed, the peace and privileges which we have granted to them and confirmed by this our present charter. In such wise, namely, that if we, or our justice, or our bailiffs, or any one of our servants shall have transgressed against any one in any respect, or shall have broken one of the articles of peace or security, and our transgression shall have been shown to four barons of the aforesaid twenty five: those four barons shall come to us, or, if we are abroad, to our justice, showing to us our error; and they shall ask us to cause that error to be amended without delay. And if we do not amend that error, or, we being abroad, if our justice do not amend it within a term of forty days from the time when it was shown to us or, we being abroad, to our justice: the aforesaid four barons shall refer the matter to the remainder of the twenty five barons, and those twenty five barons, with the whole land in common, shall distrain and oppress us in every way in their power,--namely, by taking our castles, lands and possessions, and in every other way that they can, until amends shall have been made according to their judgment. Saving the persons of ourselves, our queen and our children. And when amends shall have been made they shall be in accord with us as they had been previously. And whoever of the land wishes to do so, shall swear that in carrying out all the aforesaid measures he will obey the mandates of the aforesaid twenty five barons, and that, with them, he will oppress us to the extent of his power. And, to any one who wishes to do so, we publicly and freely give permission to swear; and we will never prevent any one from swearing. Moreover, all those in the land who shall be unwilling, themselves and of their own accord, to swear to the twenty five barons as to distraining and oppressing us with them: such ones we shall make to wear by our mandate, as has been said. And if any one of the twenty five barons shall die, or leave the country, or in any other way be prevented from carrying out the aforesaid measures,--the remainder of the aforesaid twenty five barons shall choose another in his place, according to their judgment, who shall be sworn in the same way as the others. Moreover, in all things entrusted to those twenty five barons to be carried out, if those twenty five shall be present and chance to disagree among themselves with regard to some matter, or if some of them, having been summoned, shall be unwilling or unable to be present: that which the majority of those present shall decide or decree shall be considered binding and valid, just as if all the twenty five had consented to it. And the aforesaid twenty five shall swear that they will faithfully observe all the foregoing, and will cause them be observed to the extent of their power. And we shall obtain nothing from any one, either through ourselves or through another, by which any of those concessions and liberties may be revoked or diminished. And if any such thing shall have been obtained, it shall be vain and invalid, and we shall never make use of it either through ourselves or through another. 62. And we have fully remitted to all, and pardoned, all the ill- will, anger and rancour which have arisen between us and our subjects, clergy and laity, from the time of the struggle. Moreover have fully remitted to all, clergy and laity, and as far as pertains to us have pardoned fully all the transgressions committed, on the occasion of that same struggle, from Easter of the sixteenth year of our reign until the re-establishment of peace. In witness of which, more-over, we have caused to be drawn up for them letters patent of lord Stephen, archbishop of Canterbury, Lord Henry, Archbishop of Dublin the aforesaid bishops and Master Pandulf, regarding that surety and the aforesaid concessions. 63. Wherefore we will and firmly decree that the English Church shall be free, and that the subjects of our realm shall have and hold all the aforesaid liberties, rights and concessions, duly and in peace, freely and quietly, fully and entirely, for themselves and their heirs from us and our heirs, in all matters and in all places, forever, as has been said. Moreover it has been sworn, on our part as well as on the part of the barons, that all these above mentioned provisions shall observed with good faith and without evil intent. The witnesses being the above mentioned and many others. Given through our hand, in the meadow called Runnymede between Windsor and Staines, on the fifteenth day of June, in the seventeenth year of our reign.